Wonton noodles (sometimes called wantan mee) probably needs no introduction. 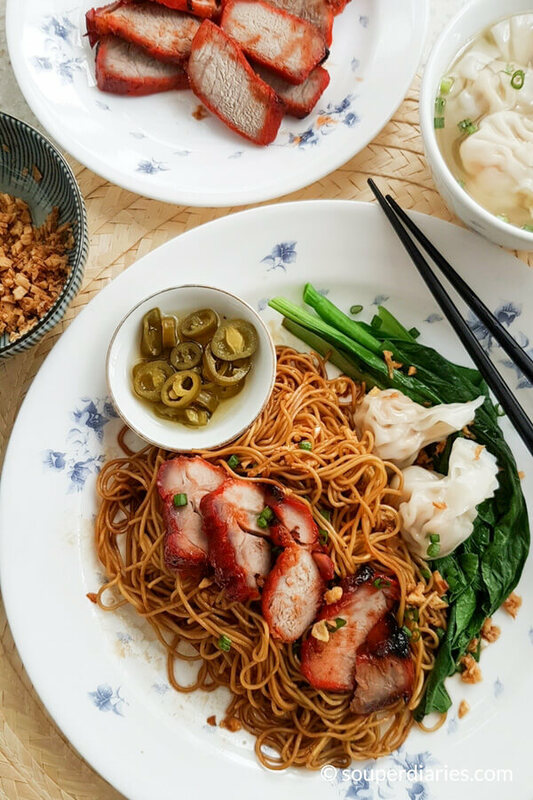 In this dry wonton noodles recipe, egg noodles is tossed with seasoning and garnished with choy sum and char siu (Chinese barbecued pork). It is a popular Cantonese noodle dish in Singapore, Malaysia and many other parts of the world. After my recent post on how to wrap wontons, I had bags and bags of leftover wontons which I kept in the freezer. I just LOVE frozen wontons. They’re so convenient to have on busy days or days when I don’t feel like making a meal from scratch. It’s my current favorite freezable food. For the past 2 weeks I’ve been steadily using up my supply of frozen wontons. And that’s how I ended up making this dry wonton noodles. I used to think that dry wonton noodles would be troublesome to make but it’s actually not that difficult. All you need to do is to get your ingredients ready before assembling them. If you’re cooking this for a group of hungry people, deft hands and a meticulous sequence will help to make the cooking process faster and smoother (and less stressful). For optimal efficiency, have 2 pots on the stove at the same time – one to cook the vegetables, wontons and noodles and the other to heat up the chicken stock for the broth. And for this particular dish (or any noodle dish that needs to be boiled), I find that a noodle sieve to be an indispensable tool. Frankly speaking, I don’t measure the amount of condiments whenever I cook this so each time I make dry wonton noodles, the seasoning will turn out a little different but tasty nevertheless. But since this is a dry wonton noodles recipe, I took down notes. Feel free to adjust the seasonings to your preference. Leafy vegetables (usually choy sum) provide a nice refreshing contrast to the savory noodles. Sometimes I switch it up and use baby bok choy or napa cabbage (wong bok – I love their natural sweetness). If you’re using choy sum, cut them up to separate the stems from the leaves as the stems will take slightly longer to cook. For baby bok choy, cutting is not necessary as they’re already small (and cute!). Whichever greens you choose to use, they’ll only need a very short time to blanch. I made this dry wonton noodles with frozen wontons. Of course, you could also use freshly made wontons. For dry wonton noodles, the wontons are usually served separately in a bowl of broth. At some places, dry wonton noodles is also served with deep-fried wontons. You may have to gently nudge the wontons to prevent them from sticking to the pot while cooking. Depending on the size of the wontons, they’ll need between 3 – 5 minutes of cook time. Egg noodles cook very quickly. To achieve springy noodles, they are first cooked in boiling water for a short time then placed in a cold water bath. Thereafter they’re brought back to the pot for a few seconds just to warm up. 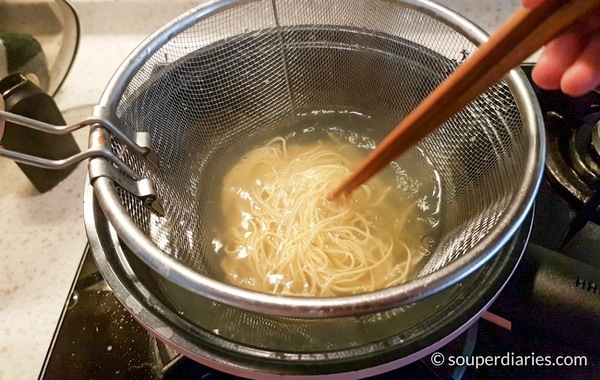 A noodle strainer is very useful and convenient when boiling noodles. But if you don’t have a noodle strainer, a Chinese sieve would work just as well. 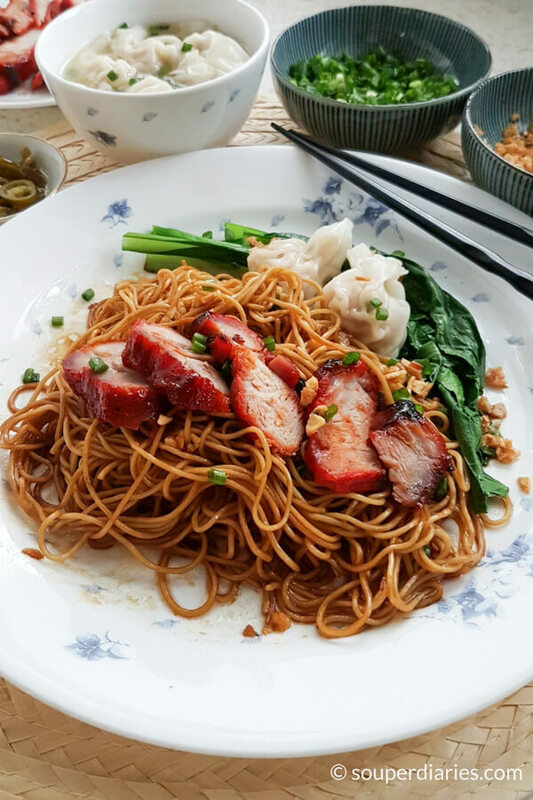 Dry wonton noodles is usually served with char siu. Char siu is sold at Asian markets and some supermarkets. I usually get them from my favorite roasted meat seller as I find the supermarket ones too dry for my liking. Using some kind of oil is a must for the seasoning. Otherwise, the wonton noodles will be dry and clumpy. I used a combination of garlic oil and sesame oil. Fried shallot oil is also a good choice. I like my dry wonton noodles to be slightly wet so I added some of the water used to boil the wontons. In Singapore, most stalls that sell dry wonton noodles will also have a chili version. Pickled green chilis is a perfect pairing with the wonton noodles. The tart and sweet green chilis provide a nice balance to the savory noodles. I also added some chopped spring onions and fried garlic. And that is it. If you love wonton AND noodles, you’re going to love this dry wonton noodles. The ingredients for this dry wonton noodles recipe are simple but when thrown together, it makes a tasty and satisfying meal. It’s also a great way to make use of that frozen wontons in your freezer. Enjoy! Be sure to check out more ’30 minute or less’ recipes here. Wontons and char siu (Chinese BBQ pork) served on a bed of egg noodles tossed in a flavorful sauce. Add all ingredients for seasoning (except water) onto a plate and set aside. In a small pot, blanch choy sum stems in boiling water (add a little cooking oil into the water if you want your veggies to be glossy) for about 30 seconds followed by the leaves for about 10 seconds. Remove with a large strainer and set aside. Using the same pot, bring back water to the boil and cook wontons for 4 - 5 minutes on medium high heat. Gently nudge the wontons occasionally so that they won't stick to the bottom of the pot. Make sure the wontons are fully cooked before removing all of them from the pot. (I usually test by taking one out to cut open). Set them aside in a bowl. Take 2 tbsp of the liquid used to cook the wontons and add them into the prepared seasoning. While you're cooking the wontons, heat up chicken stock in another pot. Turn off heat and pour into the bowl of cooked wontons. Bring water to a boil again. 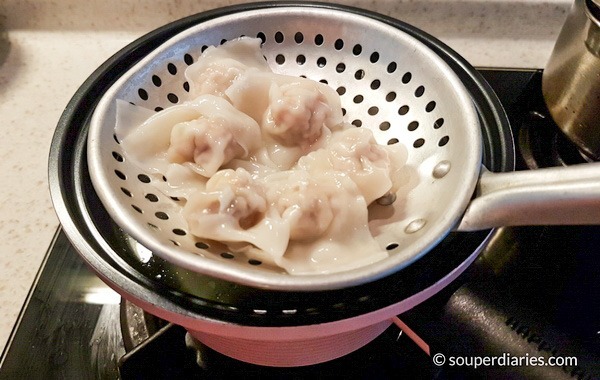 Add wonton noodles into a noodle strainer and place it inside the pot. Cook for 15 seconds or slightly longer till noodles is done to your liking. Loosen the noodles with a pair of chopsticks as it cooks. Remove noodles (use a large sieve if not using noodle strainer) and place in a bowl of cold water. Return the noodles to the pot for 5 to 10 seconds just to warm it up. Put the noodles onto the plate with seasoning. Toss the noodles till evenly coated with the seasoning. Garnish noodles with blanched choy sum, spring onions, fried garlic bits and sliced char siu. Serve with a bowl of wonton soup and pickled green chilies. 1. This recipe takes about 20 minutes to prep and cook. Prep time does not include time to make the wontons. I used frozen wontons from a batch that I made earlier. 2. Multiply the amount of ingredients according to the number of people you'll be serving. Oh that all looks so good. I love Asian food, especially noodle soups. My sister and I like to drive down to an Asian buffet about 50 miles from where we live in the mountains. Their hot and sour soup is the best on the planet. Thanks for the recipes; we can make some great soups at home with these recipes and new ideas. Hey Yvonne, I enjoyed your article but could hardly finish it as my stomach was growling. You put me in a spot here…it is too late to go out for supper and the only way is to learn how to cook my own dry wonton noodles!!! Seriously, I am no cook but I want to try your recipe someday…soon. This looks absolutely delicious! With that BBQ pork laid on top as well I can’t resist it. I’m going to have to try it as soon as I get home from my current vacation. You always have the best recipes! I’ll let you know how it turns out as soon as I try it. Thanks, Craig. Hope you’ll like this dry wonton noodles recipe! Thanks a lot for this recipe! Cooking and eating at home is much cheaper than eating out, and your dry wonton noodles looks delicious! My husband loves Asian food. He could it all day, everyday. I usually find it a bit difficult to cook it, but your recipe is easy to follow and it looks amazing. Thank you for sharing. Another mouth watering post Yvonne. Thank you so much for sharing this. I’m heading down to the grocery now to get the ingredients for dinner. This is beautiful. Thanks so much for this post. I love Asian foods. I love the way it’s laid out.